The car was traveling westbound on Norbeck Road when it crashed with the van that was making a left turn from Westbury Road onto westbound Norbeck Road. WASHINGTON — Several people are hurt after a crash in Montgomery County Friday night. 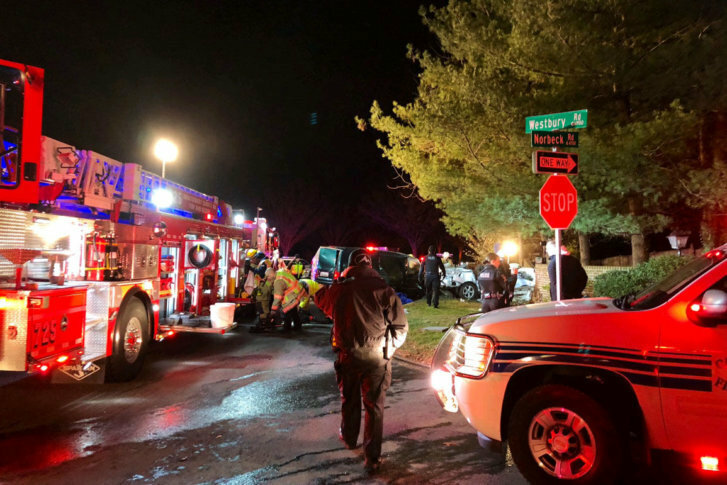 It happened on Norbeck and Westbury roads around 7 p.m. Montgomery County Fire and Rescue tweeted that it was between a car and a van. Five people in the car were trapped and had to be extricated. All five — the driver who is a teenaged girl, a woman who was in the front-passenger seat and three girls in the back — have critical injuries. They were transported to the hospital, as well as the man driving the van, who has injuries that are not life-threatening. The car was traveling westbound on Norbeck Road when it crashed with the van that was making a left turn from Westbury Road onto westbound Norbeck Road, a news release said. After they crashed, the car struck a brick sign on the side of the road. Several lanes were blocked while police investigated. Editor’s note: Montgomery County Fire and Rescue tweeted earlier that three adults and three teenagers were hurt. The story has been updated with the latest information about the victims.